If you could go to any festival in the world, where would it be? Maybe Glastonbury, perhaps the most well-known musical gathering of its kind? Or the OktoberFest in Germany, where you need an iron constitution to keep down epic quantities of beer? Perhaps the legendary Carnival in Rio de Janeiro, a riot of colour and Samba beats. Most of us will have either been to a festival of some kind, or have a pretty strong idea of what they involve. Single or multi-day events featuring music, comedy, food and drink, religion or education, often a combination of themes, which are either a way to party, spend some quality family time, or experience new cultures. But how about one of these events, where the fun comes from quite bizarre situations, and wonderfully weird chaos happens! Songkran is a religious festival celebrating the South Asian New Year from 13-15 April, during which Buddhist monks apply coloured powder and sprinkles of water to the faces of the faithful. At least that’s how it worked traditionally. 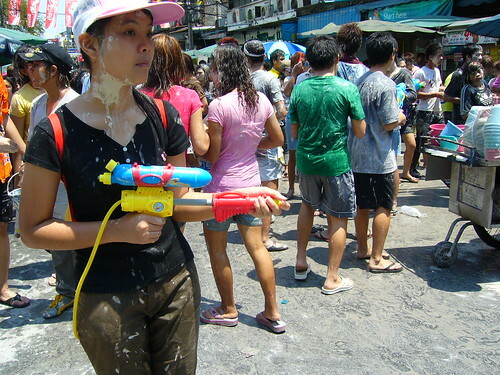 Now, especially in Thailand, it has become in essence a country-wide water-fight. Visit Bangkok or Chiang-Mai during this period and you can expect to be roundly soaked from dusk til dawn. It’s all in good humour of course, and a huge amount of fun. The centrepiece of this well-known festival in the Nevada desert is the burning of a wooden effigy. Created as an expression of radical thought, self-reliance, community and artistry, a massive city-structure is erected every year, with participants arriving in mutated vehicles and all manner of crazy clothing. There is truly nothing else quite like the week-long Burning Man – if you can get hold of a ticket then make sure you visit at least once. Legend has it that this festival in the town of Buñol, near Valencia in Spain, originated from a brawl in the main square, when a crowd of young men raided the nearest vegetable stall for ammunition. It has now grown into one of Europe’s most famous events, where thousands of people throng the streets to take part in a wild day of tomato-throwing. In the late afternoon local people will stand outside their houses with garden hoses to clean off all the red gunk. This one is truly bizarre. Held in Japanese temples, gigantic Sumo wrestlers face each other which holding babies aloft. The rules state that whichever baby cries first is the winner, the gods having blessed it. This has been going on for over 400 years believe it or not! Or, man versus fish. In Port Lincoln, Australia, for the last fifty years people have been promoting the tuna industry by taking it in turns to grab one of these hefty fish, swing it around like an Olympic hammer-toss, and fling it as far as they can. Nutters. Music and foodie events, fireworks and floats make this a great family day-out, if you can stand the smell. Mexican for Day of the Dead, holiday-makers on USA tours at the start of November will often make a detour to Mexico to take in one of the most fascinating events of its kind. During two days and nights of remembrance for the departed, graves are cleaned and offerings left; skeleton costumes are worn through the streets; and loud singing and dancing takes place in the hope of waking the dead. Not as ghoulish as it may seem, this is a heartfelt and respectful means of tribute to those that have passed on.